(APN) ATLANTA — “No Medicaid Cuts, No Medicaid Caps, No Cuts to Medicaid Waivers.” These were the demands from over fifty people with intellectual and developmental disabilities (I/DD) at the Georgia State Capitol, on Wednesday, july 12, 2017. Their protest highlighted how the various U.S. Congressional Republican proposals to repeal the Affordable Care Act would harm Georgia. People with disabilities would be disproportionately hurt if the Medicaid waiver programs that provide home and community based service for about 12,500 Georgians with I/DD are reduced or eliminated. Over 10,000 people with disabilities are on a waiting list for these home-based services in Georgia. 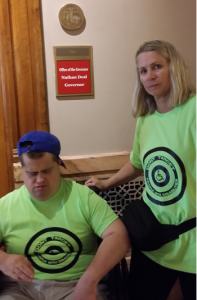 Arc, an organization that supports people with I/DD, held a meeting at the Capitol for the purpose of education and to meet Gov. Nathan Deal. Some came in wheelchairs from long distances to tell their stories of years of hardship waiting to get the Medicaid waiver so they can stay at home and not be in an institution or nursing home. Bernard Baker has been in a wheelchair his whole life and the Medicaid waiver service allows him to be at home and not in a nursing home. He has had the Medicaid waiver for twelve years but it took him ten years to get it. “If you take my Medicaid away, that will give the State the option to put me in a nursing home and I refuse to do it. We have a right to live in our own community and our own home,” Baker, with People First of Georgia, said. “I don’t want the young people to go through what some of us old timers went through to survive in Georgia,” Baker said. Georgia has almost two million people enrolled in Medicaid. Among them, 66 percent are children and 25 percent are seniors and people with disabilities. John and Widget Richards shared their son’s story. 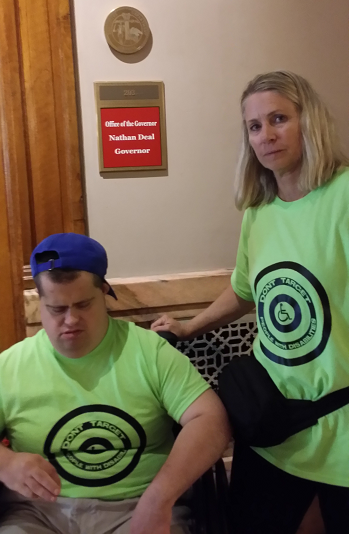 Nick is 35 and has Down’s Syndrome and visual impairment and needs 24/7 care. He has had a waiver since age twenty that provides him the opportunity to live in different settings. “Medicaid waiver is huge for us. What will we all do without this waiver?” Mrs. Richards asks. Almost all fifty people in the room have a Medicaid waiver for home services or have a family member who has this waiver. Meymoona Freeman’s little girl, Luna, was born disabled. “Medicaid paid for all of her care, which wouldn’t have been possible if not for Medicaid,” Freeman said. “Three out of four people in nursing homes are funded by Medicaid, and one out of three people with disabilities are funded by Medicaid. Fifty percent of children in Georgia are funded by Medicaid, and nineteen percent of all Georgians get their health insurance through Medicaid,” Dawn Hawkins Johnson, Director Adult Programs at Frazer Center, said. Johnson has tried to get an appointment to talk about Medicaid cuts with Gov. Deal since March. “We are trying to get a meeting before they go to a vote next week because U.S. Sen. Isakson (R-GA) said he would rely on the Governor’s input,” Johnson said at the time. Since then, the U.S. Senate put their plans to repeal the ACA on hold, as they could not muster enough votes for any specific version of their proposed replacement, the Affordable Health Care Act, or AHCA. “They don’t consider per capita allotment and block grants as cuts. It is a cut, but they don’t consider it a cut, so he could vote for block grants or per-capita caps and say I didn’t vote for cuts,” Johnson told Atlanta Progressive News. Elected officials are having telephone or teleconference town hall meeting because they are afraid to meet face to face with constituents who are upset about all things in Washington, D.C., these days. “To get a meeting with Senator Isakson, we had three rallies outside his office with people with disabilities, multiple phone calls, and emails before we finally got a meeting,” Johnson said. Georgia’s Lt. Governor’s office made a statement to Arc that the Georgia waivers are safe because they will be grandfathered in. “I realized we had to educate not just the public, but also our policy makers who did not really understand what was coming down,” from D.C., Ramirez told APN. The proposed cuts in the Senate bill would put Medicaid’s waiver benefits at risk for home and community based service. On the other hand, institutional care is a mandatory Medicaid service, which is why many disabled people in Georgia worry they could become institutionalized.